That time of day has come around again where you need to prepare the evening meal. You start by pulling out your supplies… and you can feel the frustration already starting to creep in. The saucepan is easy enough to grab, but the stack of lids starts to spill over and of course the one you need is at the bottom of the pile! You open your utensil drawer, but it’s a jumbled mess and it takes a while to rummage through to find the spoon you need. You want to use your handy chopper to slice the onions, but the blade is buried under a pile of other ‘handy’ attachments that are rolling around the cabinet shelf. It’s little wonder you don’t enjoy cooking! Can you relate to any of the struggles in this scenario? Some of the biggest frustrations in the kitchen stem from having too much ‘stuff’, a general lack of storage, and difficulty finding and accessing what you’re after. What you need is an efficient and organised space that takes advantage of every inch of storage, while allowing you to quickly and easily find and retrieve everything you need to cut down on preparation and cooking time. A kitchen that doesn’t leave you feeling stressed and frustrated is a must, as it’s a room we spend so much time in! And I believe the solution to many kitchen organisation problems can be found in one magic item - the simple storage basket. I know it might seem a little far-fetched to claim that a humble plastic basket can solve your kitchen woes, but I am a firm believer that this item truly can be a magic fix. And it’s safe to say I am addicted to using this storage solution whenever I can - you’ll find baskets of different sizes all throughout my house, but they are definitely used most in the kitchen. A plastic item is easy to clean - just tip the contents out, give it (and the drawer or shelf) a quick wash or wipe, pop the items back in and the basket in place, and you’re good to go! To organise our kitchen cleaning products, I use two baskets to separate dishwasher tablets and Rinse-Aid; and cloths and sponges. Because the baskets act as drawer dividers, I’ve also got the perfect amount of space at the back of this deep drawer to store tea-towels, hand-towels, and bin liners. Long, narrow baskets are ideal for these deeper drawers! 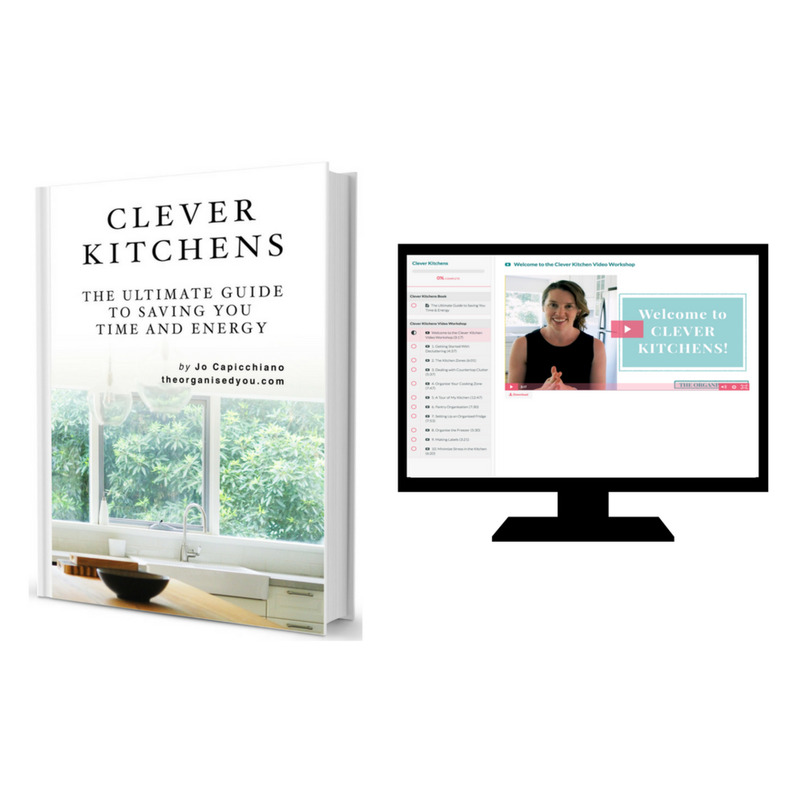 SAVE YOU TIME AND ENERGY, IN 'CLEVER KITCHENS'. Because we have a carousel in our corner cupboard, it wouldn’t be practical to stack our saucepan lids - they would topple over every time we turned the carousel! So a plastic basket is the ideal solution for storing lids upright, with added room for food processor attachments. This tub is quite tall so these larger items are stored securely, and won’t fall out when the carousel is spun. I love our choppers and mixing jugs, but all those lids and extra attachments become a nuisance if they are left to loosely float around the drawer. Plus it makes it harder to find what you need. A narrow basket secures them in one spot, and because the basket is clear, the drawer looks neat and tidy. 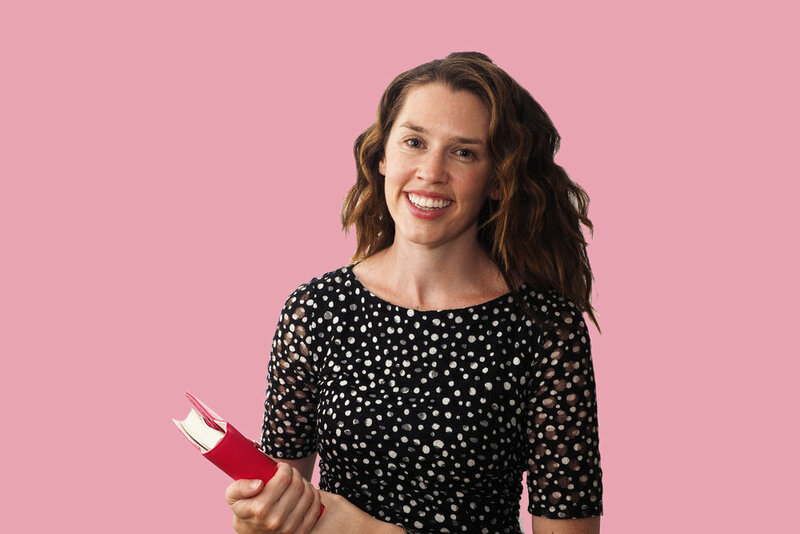 Put an end to your 'junk drawer' by creating organised categories of things you actually use and need. Because I use all of our stationery items on a fairly regular basis, often when I’m standing at the island bench, it makes sense to keep them in the kitchen. A set of narrow, smaller baskets works perfectly to corral stationery, and ‘extras’ such as matches and string. This basket size is also perfect for organising a utensil or cutlery drawer because they act as dividers - you can see here how I organised our drawers in our previous kitchen. Sometimes I feel like our house breeds water-bottles - they always seem to be popping up on every surface! After a bit of water-bottle culling, I found a basket was the perfect solution for storing them upright in a deep drawer, and preventing them from toppling over each time the drawer is opened. In our previous pantry, I loved using handled baskets to store different food categories, such as snacks and treats. Now that I’ve invested in great pantry storage containers, I use the baskets in our baking drawer - a small one to organise food colouring and cake decorations, and a slimline one to hold ‘grown-up’ treats! These baskets can also be great to use in the fridge for categorizing different items (see how I used them here). The dreaded plastic containers would surely be the biggest organisation trouble spot in many people’s kitchens - I know I used to struggle with them! In our current storage container drawer, I stack all our containers by size and shape, and use a tub to separate containers from lids so that everything is organised and, more importantly, easy to find. 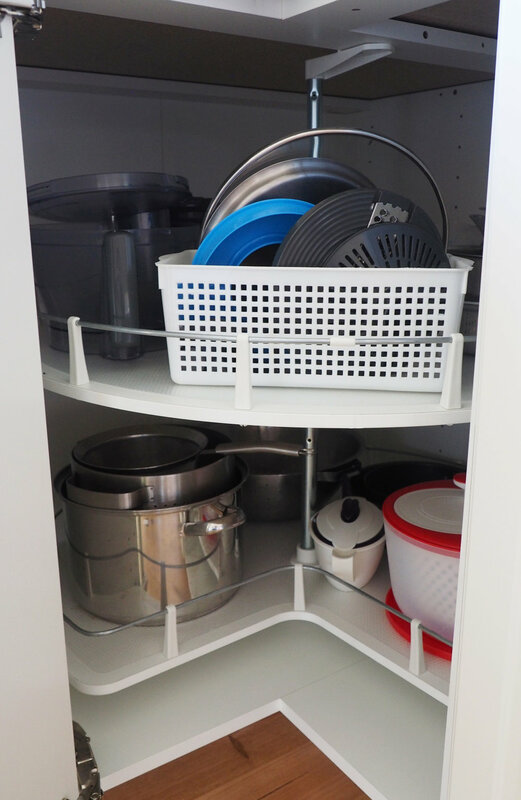 You might want to also check out this video of how I organised a client’s plastics cupboard using storage baskets. One of my favourite makeovers! So, do you see how genius this simple storage item it is? You can use it in so many different ways to achieve greater organisation in your kitchen (and the rest of your home), and because it is so cheap, you can really go to town! 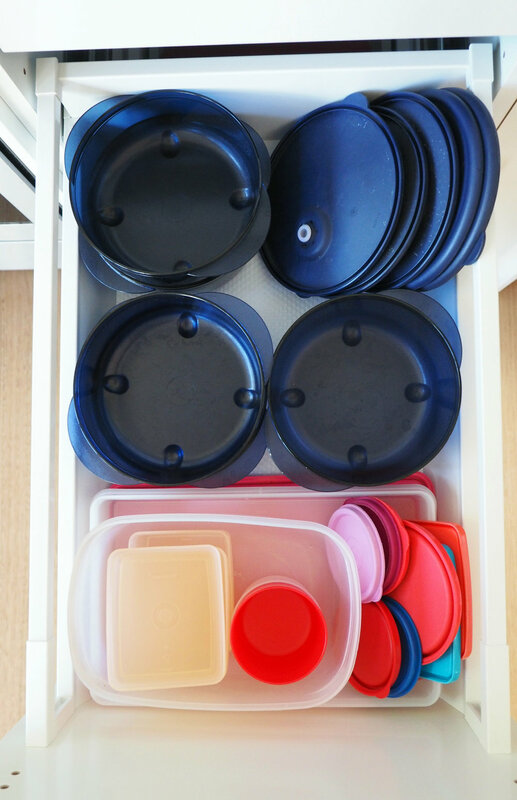 You might even have existing plastic containers or storage tubs that would do the trick - it’s all about finding the right size and depth to fit in your drawers and cupboards. You should be aiming to utilize every inch of available space to really maximise the storage in your kitchen. Do you use this magic solution in your own kitchen? Do you have any other genius organising items you love to use?